In April 2017, Gary Ge from OmicSoft presented the webinar, Next Generation Of OmicSoft Lands on AWS Cloud, which described OmicSoft's transition into a cloud-based Land system. For those who missed the webinar, please watch the recording here, or read through this article on how our new Land technology may improve our service. OmicSoft’s Land technology has enabled collection and management of large public data sets in curated knowledge bases in the fields of cancer genomics (OncoLand), cardiovascular, metabolic and immunology (DiseaseLand), as well as genetic research (GeneticsLand). With more data being curated daily, and more users requesting content faster, we have been focused on creating a better solution for public Land delivery. With the rapid growth of our Land database, we now provide 32 Lands including OncoLand and DiseaseLand to customers. Previously, we delivered and updated all content of approximately 1.5TB data each quarter. The delivery often takes 1 to 5 days, and requires server-based parallel publishing, which takes a lot effort for both OmicSoft and company IT/OmicSoft product administrators. In 2014, OmicSoft released Studio on the Cloud, and continues to improve its cloud implementation since inception. Studio on the Cloud allows users to seamlessly run all Array Studio analytics from Amazon, combining the storage of S3 (Amazon Simple Storage Service) with the analytical power of EC2 (Amazon Elastic Compute Cloud). Omicsoft has seen an increasing number of clients that implement mixed mode solutions (cloud solution in addition to their SGE/PBS/LSF cluster). To date, most of our clients have chosen to switch to cloud-based Land delivery. Please speak to the OmicSoft support team, or your company administrator to understand how cloud-based Land delivery can benefit your research. Copy number variation is large-scale change in many locations in the genome, including insertions, deletions, inversions and duplications. A CNV can be defined as a DNA segment that is 1 kb or larger and present at variable copy number in comparison with a reference genome (Redon, R., et al. 2006) . CNV has been linked to many human diseases and has been found in all human populations. It also plays an important role in evolution. Array Studio provides comprehensive functions to manage, visualize, analyze and integrate CNV data. In this article, we will introduce the basic functions of CNV analysis. Array Studio can import SNP and Copy Number Variation (CNV) intensity data, to analyze your samples for chromosome-wide and local amplifications, deletions, and Loss-of-Heterozygosity (LOH) events. The users can easily view, sort and filter data. Filtering Log2 ratio data imported from Affymetrix CEL files. Each column is a sample and each row is a probe set (SNP in this example). Array Studio can merge probe-level SNP intensity data to genomic regions, or segments, with predicted copy numbers for each segment. The CNV Segmentation command will generate segmentation results for Log2Ratio CNV Data, using a variety of criteria, to identify copy number segments, and any Loss of Heterozygosity segments. The CNV Segmentation Command Window allows users to change segmentation parameters. After segmenting CNV data, Array Studio has multiple interactive Views to help quickly identify meaningful amplifications and deletions. As with all Array Studio Views, users can sort, filter, and customize the Views to maximize the ability to identify these changes. These data can also be viewed in the Omicsoft Genome Browser. Segment View displays segmented signal intensity along each chromosome. For example, the TCGA tumor sample has a chromosome-wide loss of signal on chromosome 10 comparing to normal sample. Segment Chromosome View displays copy number predictions along chromosome schematics. As we can see, again, the TCGA tumor sample has a loss of signal on chromosome 10. Omicsoft Genome Browse also allows user to integrate CNV data with DNA-seq data. Omicsoft Genome Browser can display multiple data types, including CNV chip and DNA-Seq data. With mapped DNA-Seq data, Array Studio allows users to identify, visualize and annotate sequence, mutations and copy number variations. In this article, we walk you through a few important DNA-Seq analysis modules. Users can run Summarize Variant Data module to identify SNPs, insertions and deletions. It also automatically runs in DNA-Seq pipeline. The output Variant Report can be annotated with Mutation Annotator databases. This module returns a report table showing the gene name for each annotated mutation, chromosome, position, reference allele, mutation allele, Annotation type (intron, non-synonymous, 5’ UTR, synonymous, 3’UTR, etc. ), AAPosition (amino acid position of change), AAChange (amino acid change—if there is one), transcript ID, transcript name, transcript strand, distance to 3’ end, and distance to 5’ end. Variant Call Format (VCF) data is the most common format for reporting sequence variation. Array Studio variant detection can output merged or individual VCF files, and can organize and annotate these data for efficient filtering in Array Studio. and public database-based annotators, please check out our wiki page on Annotate Variant Files. Array Studio provides a large number of classifiers and annotators to improve the identification of interesting variants. Examples include: 1000Genomes, ClinVar, GERP++, dbNSFP (database for nonsynonymous SNPs' functional predictions), GRASP : Genome-Wide Repository of Associations between SNPs and Phenotypes, GWAVA, Haploreg, RegulomeDB. If you have matched pair DNA-Seq data between tumor and normal from the same subject, you can run the Var Scan 2 matched pair analysis. this annotates somatic mutations that compare two samples from the same subject such as tumor or normal for differences in genotype. It will generate calls for genotype of the samples and flag germline versus somatic mutations. For each variant, the result reports "Normal coverage/frequency", "Tumor coverage/frequency", "Somatic/variant p-value", "Call", "NormalGenotype", "TumorGenotype" and "FilteringStatus", allowing the user to filter the result and identify somatic mutations of interest. DNAseq Whole-Genome and Whole-Exome data can be processed in Array Studio to detect amplification and deletion events. By comparing the relative signal between samples from the same subject, regions with unusually high or low signal in the disease sample will be flagged as a potential Copy Number Variation (CNV) event. The result can be visualized in a few ways, including scatter plot, segment chromosome view, or in genome browser. Summary Copy Number report provides "Observation", "Log2Ratio", "Copy Number", "Normal Coverage", "Tumor Coverage", and segment information. Genome browser view of coverage data. The highlighted example clearly has an increased coverage for this genomic region, while the coverage is comparable in adjacent region. For more details and additional DNA-Seq analysis function, please check out our video tutorial Getting Started with DNAseq Analysis or search on our wiki page about your specific topic of interest. Omicsoft Next Generation Sequencing (NGS) analysis includes NGS (next generation sequencing) bioinformatics tools for the entire process, from QC to alignment to post-alignment summarizations and analysis. Array Studio provides a suite of tools to quickly, easily, and reliably process DNA-seq data. In this article, we introduce our tutorial on DNA-Seq analysis pipeline and data QC. We will discuss more on downstream analysis functions in the coming blog(s). In Array Studio, users have the choice of either executing each step of the analysis one-by-one, or can use the DNA-seq pipeline function. 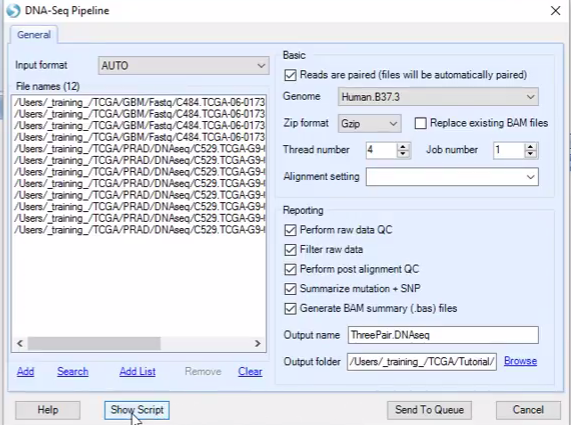 Our video tutorial will walk you through the functions automatically executed by the standard DNA-seq pipeline, starting with raw reads in .fastq format. 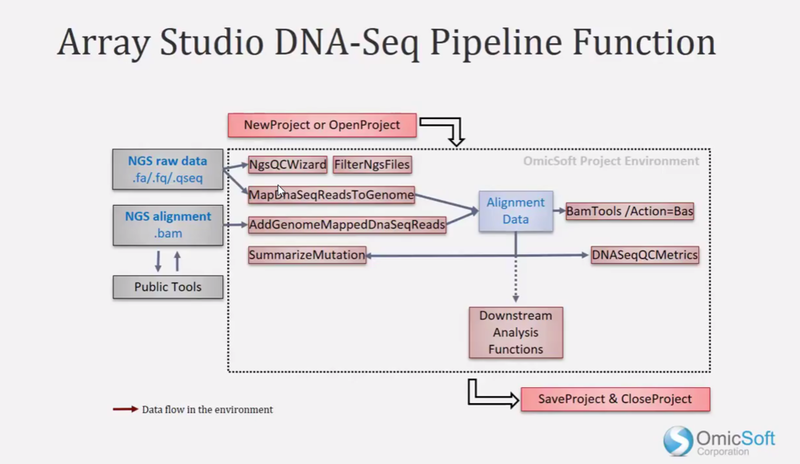 DNA-Seq Pipeline. Users have the options to choose to perform analysis steps such as raw data QC, post-alignment data QC, summarize mutation and SNP etc. If you choose to perform analysis step by step, before aligning your DNA-seq data, you must first perform quality control (QC) on the raw data, to spot common problems like adapter or barcode sequence contamination, degraded quality at ends of reads, or problematic samples. The Array Studio Raw Data QC Wizard reports a number of useful measures of raw NGS quality. Additional information about how to interpret these functions can be found in the RNA-seq Raw Data QC Analysis video. Map (DNA-Seq) Reads To Genome is a part of the DNA-Seq pipeline. Users can also align reads independently. In the Advanced tab, the user can set a number of options, including read trimming, adapter stripping and more. Array Studio automatically generates an Alignment Report after aligning reads to the genome or transcriptome. Additional alignment statistics can be generated by running the Aligned Data QC module. Please check out our video tutorial Getting Started with DNA-seq pipeline functions for more detailed illustration. Last time, we introduced some of the basic views in DiseaseLand. In this article, we would like to introduce you to some advanced functionality: SampleSets and GeneSets. The SampleSet is powerful concept/tool that allow users to create custom sample groupings, based on data in the Land or imported tables. This video tutorial demonstrates several ways to build a SampleSet from data using selection and filters, then uses SampleSets in Land Analytics to scan the entire DiseaseLand to discover differential splicing. Grouping lesional vs non-lesional Psoriasis samples in ImmunoLand (DiseaseLand). Serpinb7 Transcript Expression grouped by lesional vs. non-lesional samples. Differential expression of Serpinb 7 in lesional vs. non-lesional samples. Besides the SampleSet tool, GeneSets are a powerful tool for grouping and comparing genes, including members of a gene family, a pathway, or co-regulated genes. These GeneSets can be used to discover DiseaseLand studies that share "genetic signatures" of common up- or down-regulated genes with your GeneSet. After adding GeneSet Some_IBD_Genes, the geneset becomes available for search. With the created geneset, users can visualize and perform analyses on the set of genes. Heatmap of Comparison for GeneSet Some_IBD_Genes. Stay tuned for a DiseaseLand comparison views tutorial! DiseaseLand features Comparison Views, allowing users to easily search and visualize statistical contrasts between groups of samples using common queries: Treated vs Control, Disease vs Normal, Responder vs Non-Responder etc. By searching a gene, the user can visualize the association with comparisons across thousands of projects, and narrow down to find interesting projects interactively. (Additional reading: ComparisonLand ). In this article, we will introduce you on how to use comparison views. Comparison distribution by comparison type. Statistics from previous Land version. Actually distribution and number of comparison update quarterly. Comparison details for Serpinb 7 by treatment vs. control. By selecting the comparisons (dots) of interest, detailed information will pop up. Omicsoft uses manually curated metadata to generate statistical tests (called comparisons) for each project/study included in DiseaseLand, generally following the comparisons in the original paper. The Comparison collection is useful for finding the common differential expression patterns/signatures between studies, such as between an microarray and NGS study, or to find links between a gene knockout experiment and a compound treatment study. Example Volcano Plot of project GSE38713. Example Venn Diagram of project GSE14905. Example Significant Genes of project GSE58121, GSE63980 and GSE63980. Starting with the Q2 2016 release, Omicsoft replaced ImmunoLand and CVMLand with DiseaseLand in its Land user interface. DiseaseLand focuses on datasets of common genetic disease including but not limited to immunological diseases, neurological disorders, metabolic diseases and cardiovascular diseases. Relatively new to customers, DiseaseLand has been gaining popularity among our prestigious client companies. For a quick review of DiseaseLand content, please check out our wiki article Introduction to DiseaseLand Content. Today, we would like to introduce to you our ImmunoLand video tutorials to help you quickly get started with DiseaseLand. DiseaseLand is similar to OncoLand at large. If you are already an OncoLand user, DiseaseLand has most of the advanced analytics functions as covered in OncoLand trainings. Comparison Distribution View. Comparison Details and Project Details are available once the users select a group of samples. For examples, Comparison Details include information on comparison test method and comparison category as highlighted in the figure. At present, DiseaseLand data is primarily focused on gene expression from microarrays and NGS studies. The user can search for a gene of interest and narrow down to find interesting projects interactively. The default view for DiseaseLand is Disease vs Normal Comparison. By selecting the comparison of interest, sample details of the comparison will be displayed in the Details Window. More details on gene, probe and project level are also available. Experimental designs in projects within DiseaseLand are quite different, and batch effects in microarray projects are difficult to remove. Omicsoft created project-specific views to display expression values based on experimental design within each project. Expression Intensity Project View provides log 2 expression intensity values. The users can easily filter their project of interest, or any other filters like disease, clinical details, or even project contributors. Expression Intensity Project View of Project GSE14580. To maximize inter-study comparisons of RNA-seq data in Diseaseland, Omicsoft processes data from each study, starting from fastq files, through a commmon pipeline. Expression values from RNA-Seq studies are expressed as FPKM values, with upper quantile normalization. DiseaseLand offer project-specific views and also a merged view from all samples. Views display log transformed FPKM values. Samples and projects can be filtered interactively to allow exploration of data. Gene FPKM View of all psoriasis samples in DiseaseLand HumanDisease. Samples can be categorized by project name (Change Symbol Properties) and clicking each project name selects the samples from the project to display the details in Detailed Window. Stay tuned for more DiseaseLand tutorials! Omicsoft has been working diligently over the past few months to both strengthen our ability to incorporate clinical data, as well as growing our list of curated clinical measurements from public datasets. Currently, there are more than 1000 different clinical measurement variables in total, including sample demographics, survival data, symptoms, treatments and more in OncoLand and DiseaseLand. Moreover, users often have their sets of internal clinical data they wish to add to the system. If you have not started leveraging the power of our clinical data subsystem, please take a look at OncoLand Case Study - Clinical Variables for a 10 mins quick video tutorial on how to utilize clinical data to identify novel associations. Stay tuned for additional functionality coming at the end of this year, including support for CDISC formatted files, to include time-series measurement data. Omicsoft's Lands are known for being comprehensive, powerful and integrated, allowing users to navigate across samples, genes, data types, datasets and platforms. As comprehensive and flexible as it can be, the system may appear to be complex for some users, with growing numbers of samples, datasets and data types. To help user apply filters more easily and efficiently, Omicsoft recently improved its filtering logic in the Lands. Previously, filters applied to one search do not carry over from the main Land tab, requiring users to apply filters all over again for any new search. For example, if the user wants to compare gene expression FPKM for EGFR in KIRC (Kidney Renal Clear Cell Carcinoma) and KIRP (Kidney Renal Papillary Cell Carcinoma), the first step might be to filter the tumor types in the TCGA_B37 main tab (to see sample numbers and understand the overall distribution of samples). Next, the user can search for EGFR and go to Gene FPKM view (Step 2). If the user wants to see the gene expression of TP53, previously the Land doesn't carry over the filter and the user needs to redo the filter again (Step 3). Imagine when one has already filtered many steps and navigated to a group of samples/genes that appear intriguing, how easy and time-saving it becomes to directly have all the filter steps applied to the new search. This filter logic applies to all left-hand side filter tabs including Sample, Comparison and all data type filter tabs. Early this fall, Omicsoft released the new Geneset Analysis functonality (See webinar Announcing GeneSet Analysis Functionality, integrated with Omicsoft’s Land databases and blog post Geneset Analysis Functionality: Integrated With Omicsoft Land Databases.). It helps users to identify comparisons containing similar gene set enrichment from both tens of thousands of gene sets in the Lands as well as customer gene sets, with directional results. Geneset Analysis is under active development, and we would like to update you with a few new features since its release. Enrichment Volcano Plot is a plot of Enrichment Score vs P-Value. The Enrichment score for the gene set is the degree to which this gene set is overrepresented at the top or bottom of the ranked list of genes in the comparisons. The plot helps to visualize potential gene sets of interest to further research on, with indication of enrichment directions. The Summary Bar Plot helps to visualize the number of overlapped genes and dynamically links to those genes with details in details window. If you an Omicsoft Land customer, give it a try with the latest Array Suite version. Let us know any comments or suggestions you have! 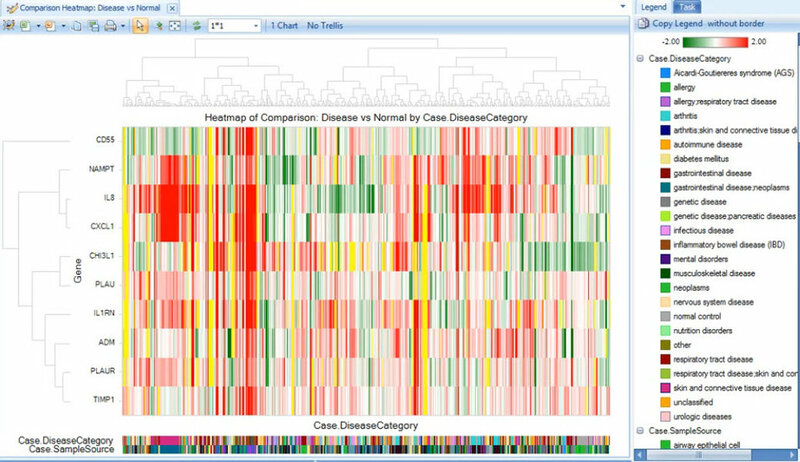 OncoLand is an Oncology database and visualization software that helps users explore public and private cancer genomics datasets. It contains tens of thousands of carefully processed and curated oncology -Omic data samples. OmicSoft uses the Land framework to deliver an increasing number of large datasets, including data types such as RNA-Seq, DNA-Seq, miRNA-Seq, Copy Number Variation, Gene Expression Chip, Protein Expression, Methylation and hundreds of clinical measurements. Example TCGA_B37 default view, displaying Sample Distribution view. TCGA, The Cancer Genome Atlas, is a comprehensive and coordinated effort to accelerate the understanding of the molecular basis of cancer through the application of genome analysis technologies. TCGALand is OncoLand's signature Land, it contains RNA-Seq, Expression Array, DNA-Seq, CNV, Methylation, and Protein data from more than 30 tumor types. TCGALand Sample Distribution across Tumor Type. TCGALand provides table and figure views on the sample, gene and clinical data level. We will introduce genomic data views in the following article, or you can refer to our video tutorials: Getting Started With OncoLand. Here, we would like to highlight clinical data views, which is introduced in the TCGALand Introduction and Overview video clip. Clinical Significance - Group Association is a dynamic view showing the association of all clinical variables with the selected grouping variable. It quickly provides insights on which clinical variables are potentially associated with the selected grouping variable. Clinical Association for TCGALand Tumor Type. TCGALand Survival Plot by Tumor Type. The Cancer Cell Line Encyclopedia (CCLE) project is an effort to conduct a detailed genetic characterization of a large panel of human cancer cell lines. CCLE provides public access analysis and visualization of DNA copy number, mRNA expression, mutation data and more, for 1000 cancer cell lines. CCLELand groups data according to Primary Site (Tissue), with histology as the secondary grouping. CCLELand Primary Grouping by Primary Site, instead of Tumor Type. Stay tuned for more on OncoLand! -Omic Data are read-only data constructs. The most common way to explore -Omic data is to add "Views" onto your data, including a "table" view to directly visualize the numerical data values or a "chart" view, such as the Variable view and Scatter plot. The most common way to look at your -Omic data is with the Table View. Although it looks like a standard spreadsheet, the Table View is actually a visualization of your underlying data. It is dynamically connected to the attached annotation and design metadata, and can be sorted and filtered without worry of altering the underlying data. Array Studio is able to easily handle millions of rows and columns in the Table View . Example table view of microarray data. The details window display the data details for selected probe sets. Depending on the contents of your -Omic data or table, Array Studio has about 40 views to interactively display your data. This video clip briefly walks through some of the more popular Views for Gene-level data; the Variable View and Pairwise Scatter Plot. Array Studio not only provides dozens of views depending on the content of data, but also allows user to tailor the visualizations to the user's preferred method. Some commonly used views for microarray data include BoxPlot, ScatterView, VariableView and VennDiagramView. The example chart is fine-tuned from variable view into violin plot grouped by time and treatment. Gene expression data can be grouped using Hierarchical Clustering by Variables (e.g. genes) and Observations (e.g. samples) to reveal associations in your data. In additional to visualizing the overall clustering pattern, you can also search datasets for variables/observations with similar patterns to your variable/observation of interest through Find Neighbors. You can display these comparisons in multiple ways, including pairwise correlation/MA plots, heatmaps, and 3D scatter plots. Probes with similar pattern to probe 1371785_at are detected through Find Neighbors module. 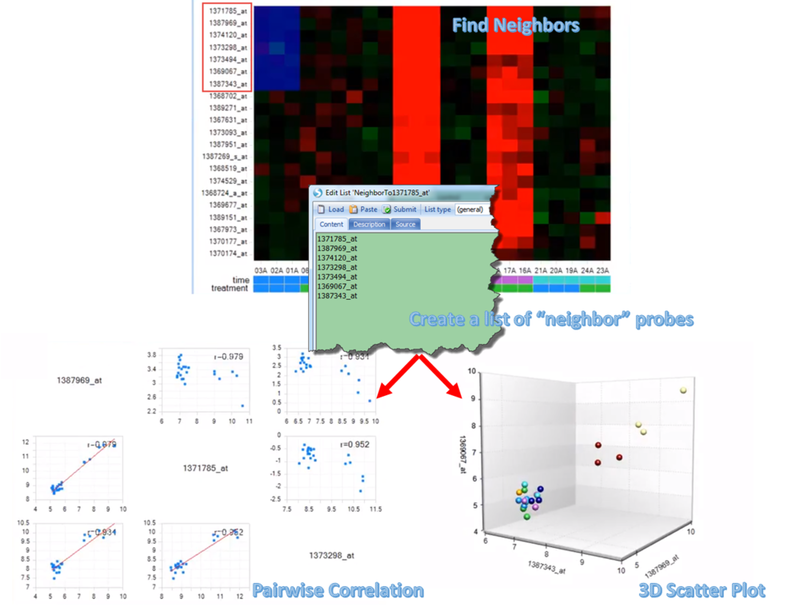 After a list of "neighbor" probes created, users can visualize the data pattern among those probes through pairwise correlation plots or 3D scatter plots. The One-Way ANOVA is used to research the effects of a single factor, while Two-Way ANOVA can be used to research the effects of two factors on expression data. This model generates an inference report, including automatically generated Report View and VolcanoPlotView. Additionally, the Venn Diagram and Inference Report Summary can help to quickly visualize the deferentially expressed genes. Inference Report Summary and Venn Diagram help to quickly research significant genes and compare across groups. If you are interested in discovering pathways or functionally related genes that are enriched in your data, you can run the Gene Ontology (GO) module. This module will perform built-in gene ontology classification on one or more significant lists. Once you generate a list of significant variables, Array Studio can go through all possible GO terms (across different class levels) to see how many variables in the list are covered by the GO terms. You can infer different biological attributes (such as functions, corresponding biological process) of the variables in the list. Example table results. Each Category lists a GO Term (with a link to the Gene Ontology website), as well as the number of hits for that category in a particular list (The column name is the list name). A corresponding p-values can also be generated. In bioinformatics research, there are many different data sources, including microarray, sequence data, CNV data, ChIP-chip data, genotype data, etc. In Array Studio, we divide genomic data into two groups, -Omic data and Table data. First, -Omic data, which is basically a data matrix with annotation for both columns and rows. Microarray data is a standard example of -Omic data. The microarray tutorial is a great starting point for new users of Array Studio, whether or not you will be working directly with microarray data. In this article, we will cover Getting Started with Array Studio Microarray Analysis on microarray analyses basics. When Array Studio is first installed, it will look similar to below. Array Studio organizes projects in the Solution Explorer. Any generated data or figure can be displayed in the middle of the window, while a Legend and Filter window appears on the right side of the window. After you create a new project, Array Studio will guide you through importing your expression microarray datasets. Three data types, OMIC measurement data table, design table and annotation table are the basic -Omic data types. After importing data and downstream analysis, Array Studio organizes data in four main data types: List Data, Table Data, -Omic Data and NGS Data in a project. -Omic data is read only table data with annotation and design tables attached (these can be modified). -Omic data and table data can be converted from one type to the other. Array Studio provides several methods to reproduce analysis steps. Omicsoft scripts (Oscript) for analysis functions can be viewed in every function window, by right-clicking on an object name, or by viewing the full Audit Trail. Array Studio tracks all analysis steps done in a project, using its Audit Trail feature. It is important for data integrity needs, and for individual users to track the changes and reproduce the procedures. Before downstream analysis, Array Studio contains modules to identify samples that deviate significantly from the rest of the data set, possibly indicating a failed sample that should be excluded from downstream analysis. For step-by-step instructions, please check out our video tutorial: Getting Started with Array Studio Microarray Analysis. For RNA-Seq, read count is a good estimate of the abundance of the target transcript. Thus, it is of great interest to compare read counts between different conditions. The DESeq GLM test is a powerful tool for inferring differential expression of genes/transcripts from raw count data. It allows the user to model the data using a linear model and test for differential expression using negative binomial distribution. The function should perform similarly to the DESeq R package. DESeq only works on raw counts of sequencing reads (with no additional background reads added to the dataset). After running the test, a report table is generated along with a scatter plot. A volcano plot will be generated as well, similarly as in the ANOVA analysis. For more details on how the DESeq method works and more functions, check out the DESeq R manual. ArrayStudio uses a straightforward approach to identifying genes with differential transcript usage between groups. This function allows user to identify diferentially expressed isoforms between comparisons. Based on transcript level data, either RPKM, FPKM or Count data, the function convert the expression values to ratios, dividing the value of each transcript by sum of all transcripts in the same gene. The highest ranking p-value reflects the largest difference in relative transcript usage. Differentially expressed isoforms report sorted by p-value. The user can directly visualized the difference in transcript usage in genome browser. Genome browser view can display exon junction reads. As it is shown, in lung, only 37 reads span certain junction but 11000 reads span the same junction in skin. For how to achieve the above results, please check out our video tutorial: Advanced Analysis of RNA-seq data. Array Studio has a large number of modules originally designed for Gene Expression MicroArray analysis, but these modules are also useful for analyzing feature-level (e.g. gene-level, exon-level) RNA-seq data. However, many of these modules expect normalized and log-transformed input data. Array Studio provides a number of methods for normalizing RNA-Seq data, including Log Geometric Mean, Mean, Median, Quantile, TMM (edgeR), TotalCount, RPKM to TPM, UpperQuartile, and LandNormalization. Array Studio also provides methods for normalizing and transforming -Omic data. The Variable View allows the user to visualize one chart for each variable in the dataset. The example variable view shows the Log 2 FPKM values for gene CLDM18, categorized by tissue and gender. Principal Component Analysis (PCA) is an effective tool to group data by components that contribute to the greatest variance in the dataset. In other words, PCA can group your data based on variance, which should reflect differences between samples. Outliers (such as failed samples) will often appear as outliers. Both 2D and 3D PCA plots are commonly used to group data or identify outliers. Gene expression data can be grouped by Hierarchical Clustering by Variables (e.g. genes) and Observations (e.g. samples) to reveal associations in your data. Array Studio can easily handle Hierarchical Clustering of up to 20000 variables, far more than the capacity of many popular gene clustering programs. Classic dendrogram is an older version of dendrogram. The new version is more interactive and provides more gene annotation information for downstream analysis. Feature-level (genes, transcripts, etc.) results from RNA-seq experiments can directly be compared to microarray data from the same samples, using the Microarray-Microarray Integration module. This module allows the user to create a duplex matrix (two values for each variable in the dataset) for two “microarray” data types. The resulting dataset can also contain correlation information for each variable, making it easy to figure out which variables correlate well between datasets. Microarray-microarray integration module provides variable views on gene and sample level showing how well microarray and RNA-seq data correlate. Gene Set Analysis is a powerful tool to help users who have their own gene signatures and would like to identify comparisons or other signatures containing similar gene set enrichment from both tens of thousands of comparisons in the Lands as well as customer gene sets for on-premises customers. Recently, Omicsoft officially released our new GeneSet Analysis function. For more details, check out our webinar recording Announcing GeneSet Analysis Functionality, integrated with Omicsoft’s Land databases presented by Matt Newman, VP of Business Development at Omicsoft on September 28th, 2016. 4. it required the user to be familiar with the Land system, and not just the analysis sub-system of Array Suite. Even though Omicsoft's Array Studio also provides a Molecular Signature module that allows users to compare to Broad's molecular signature database, the Molecular Signature module also does not take directionality into account and requires user to add straight lists to Array Studio Projects, with no ability to incorporate inference reports, nor any of the important data stored within the Lands or easily incorporate customer Gene Sets. In order to more fully leverage Omicsoft's data assets, we have officially released our new GeneSet Analysis module. The new GeneSet Analysis allows the users to query across OncoLand, DiseaseLand, Molecular Signatures, and more. In addition to the geneset databases included, the new GeneSet Analysis also provides directional results -- up and down p-values and directions. If you have any comments or suggests, please let us know. Want to give it a try? Please check out our latest webinar Announcing GeneSet Analysis Functionality, integrated with Omicsoft’s Land databases and our GeneSet Analysis wiki for detailed illustration.